Now is the time to book Santa and Mrs Claus for your events! Make Christmas one your children will never forget! Read all about us (and watch the video)on the Cedar Rapids Gazette website! Santa and Mrs Claus Home Visits – AKA Day time “Fly By” Visits. Typically done on Christmas Eve, however I can be available for your event if it’s on the weekend before or after Christmas. Santa and Mrs Claus visits your family gathering with his bag of special presents (that you provide) for your family. They pass them out and stay for a few brief photos. $50.00 per visit— These do fill up fast. Book today! Catch Santa in the Act – Your children are asleep and you hear Santa in the house. You wake your children and watch him deliver their gifts from from the shadows. He’ll be sure to eat the cookies and milk! This will be an event they will never forget. $100.00—–These spots are VERY limited. Book today! The children need to be in bed, preferably asleep. Parents wake them up and tell them they hear Santa in the house. They sneak to a place where they watch Santa from a distance as he delivers their presents and eats the cookies they left for him. The children are then rushed to bed before Santa sees them. Corporate Events. Have Santa at your holiday event to pass out presents, bonus checks or simply for an opportunity for your employees’s children to visit with Santa. The base rate for this is $100.00 per hour for Santa only – Mrs Claus is an additional 25.00 per hour We do have a reduced day rate or half day rate. Photo Booths. 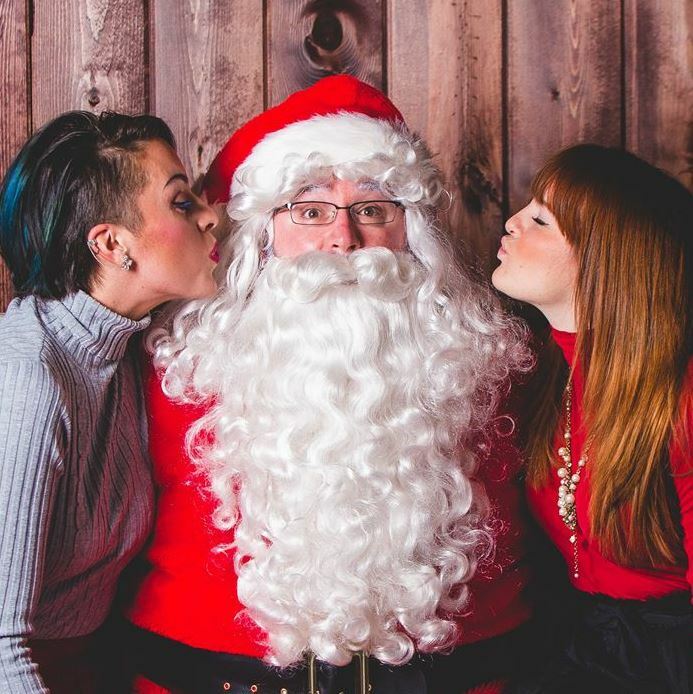 Need a Santa for your photo booth? The base rate for this is $100.00 per hour for Santa only – Mrs Claus is an additional 25.00 per hour We do have a reduced day rate or half day rate. “As they were getting ready for bed tonight my daughter said, Merry Christmas mommy. I will also remember this Christmas forever because it was the year I got to see Santa Claus.Thank you very much for what you have done for my kids and others.” – Monica R. commenting on a Catch Santa in the Act visit. “Thank you for making our family Christmas an extra special one with your Santa visit. It was a big hit with the kids of all ages.” – Lori S. commenting on a “Fly By” visit. “Chad, you were awesome!!! – Heather A. – Mercy Medical Center – Commenting on my Santa at Mercy’s Family Christmas Event 2013. It’s easy contact Kristina Canfield Via Email- thecanmanshow@gmail.com or call 319-551-6877.